Principles and elements of painting, drawing, printmaking and sculpture all come together into one application. Mostly on paper or on plywood panel, a wide-range of content goes through a vigorous and rigorous process. With oil paint, plaster, charcoal and collage, Alan develops richly dynamic surfaces using additive and deductive “marks” – an image, a scrape, a slash of paint, etc. His concepts range from layered portraits, figures, dresses, fingerprints, Americana icons, walls, stencil and text. Overall, Alan’s style falls inside Traditional and a Contemporary Art. With figurative academia and unconventionality of the avant-garde experimentation Alan brings forth boldness, sensitivity and playfulness with a dark spin. 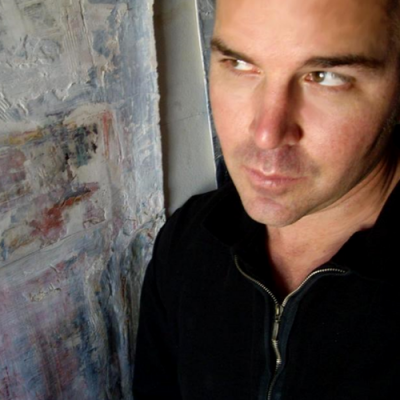 Peter Alan, visual/conceptual mixed media artist was born and raised in Southern California, completing his under-grad at Sonoma State University in Studio Fine Art, history and psychology. Then he lived in Italy to experience the concepts of art history, while receiving a mentorship from a local native Roman painter (name, non-disclosure agreement). Since then Alan has held a number of painting studios making art for galleries, non-gallery venues and private collectors throughout Los Angeles and Sonoma County. His works on paper and panels range from Contemporary Realism and Abstraction to Experimental — tinkering with anything art-makeable at reach. Currently looking to soon join Cornerstone Properties’ new art studios project, barn5400, Alan has been working at S11, Sonoma shared with Assemblage sculptor, Helena Donzelli. He has been producing artwork from the remnant ash and debris collected from his Glen Ellen home/painting studio lost in 2017 Nuns Wildfire. As a revisit to the Jasper John’s “flag” motif, the American and also the California flag depict a kind Symbolism of his content of loss, but now transformed into his most dynamic creative process. The ash, strips of charred wood and other remnant “found objects” have been integrated with collaged ink-jet images printed on emergency assistance organizations’ handouts as well as pages from his journal/sketchbook, Alan hopes to offer inspiration and healing for his community stricken with the aftermath of the worse National wildfire on record. Proceeds of artwork sales have been slated for his personal recovery fund as well as donating $25,000 to a local Sonoma County foundation fund.